Business in Japan is transforming into the next stage where more international players will be driving the market. We are already seeing an explosive change in people and money flowing into Japan by Asian tourist. This fundamental change is not only limited to tourism, but it is also slowly, but steadily, expanding into broader areas for investment and new business development in Japan. We will see more mixture in consumers, suppliers, investors, and all stakeholders in the value chain. Unlike the monumental incident such as the collapse of Berlin wall, the changes we see in the world are subtle. What seems to be obvious from the future is not always clear in our current eyes. We just get surprised finding a wrinkle in our face and kids become taller than you. And we see and hear things we want to see and hear. Whether it’s positive or negative, we see things in a way we want. This tendency sometimes clouds our view. And I have to admit I’ m not an exception. We are not a fortune teller, and we do make a lot of mistakes. But we can’t stop trying to find a clue for the future. Because in business, this is what we all strive for: searching signs and clues to seize opportunities, avoid risks, and outsmart competitors. We have to admit our limitation and try our best to see the unseen. So what do we see now? In my point of view, we are in the middle of an unprecedented transformation of business in Japan. For years, Japan has been considered as a closed community, unwilling to welcome foreigners. Foreigners are called “Gaijin” in Japanese, meaning “gai” for “outside” and “jin” for “a person”. With a few exceptions, foreigners have been kept outside, sometimes with a friendly smile and a silent rejection. It is not just innocent smile what’s keeping foreigners outside: the entire social system including the language, culture, rules and regulations, and everything from signboards to public information has been set as barriers. However, we are observing a fundamental change in the attitude against foreigners in Japan. Yes, if you look into micro Japan, you still find the old Japanese remaining. But if you see the larger picture, you’ll notice that the environment is changing in an unprecedented way. And it is reflected in the numbers. One of the most striking changes in recent years is the number of foreign visitors coming to Japan. In the 1980s, there were only 2 million foreigners, more or less, visiting Japan annually. 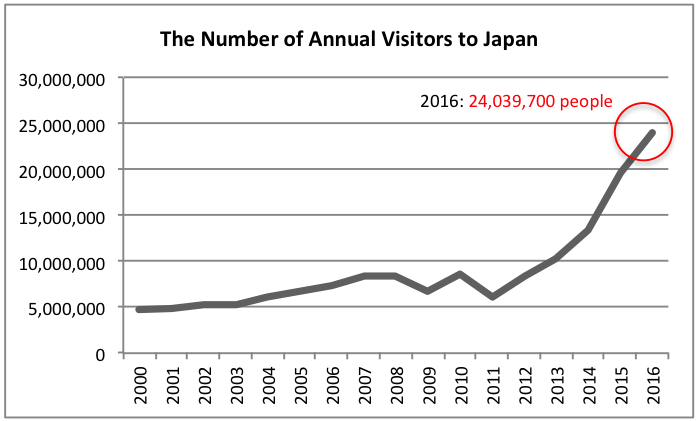 Considering the Japanese population of over 120 million, an average of 5,500 foreign visitors per day was too small to consider as a serious business. It was niche at its best. It had gradually increased to 5 million by 2000. But it wasn’t until 2012 that the sudden explosion in visitors began. 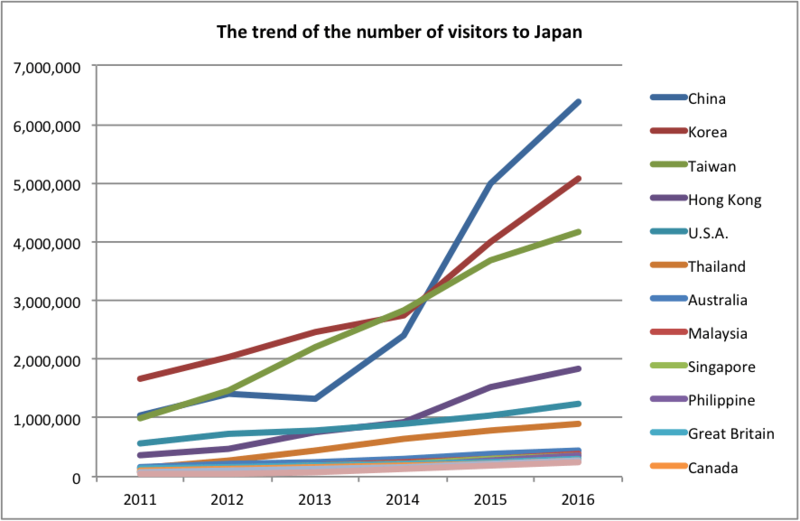 Now, the number of foreign visitors in Japan is counting more than 24 million per year and it’s still growing like anything. Every day, more than 65 thousand foreign visitors are visiting Japan on average. This increase is significant. It took 55 years for Japan to have 5 million visitors per year, but it took only 5 years to increase additional 18 million. The Japanese government is aiming 40 million by 2020. This will push Japan into top 10 of the most visited countries in the world (Japan was ranking 39th in 2011 and 16th in 2015). The majority of this increase comes from visitors from China, Korea, and ASEAN countries. China has especially made a large contribution. Although the number remains small, we are also seeing steady increases from Western countries as well. There are various reasons behind this increase: the growth of personal income in Asian countries, the decline of costs for visiting Japan, the deregulation of the visa process, and strong “Visit to Japan” campaign by the Japanese government. But what really matters is the foreigners’ increased interest in Japan. Through the internet, now the world has much easier access to information about things and places in Japan. What used to be a local interest has now spread around the world. A small ramen shop for local residents is attracting people from many countries. The local niche market is now connected to the niche market of the world. The increase of foreign visitors has brought vast cash flow into Japan. 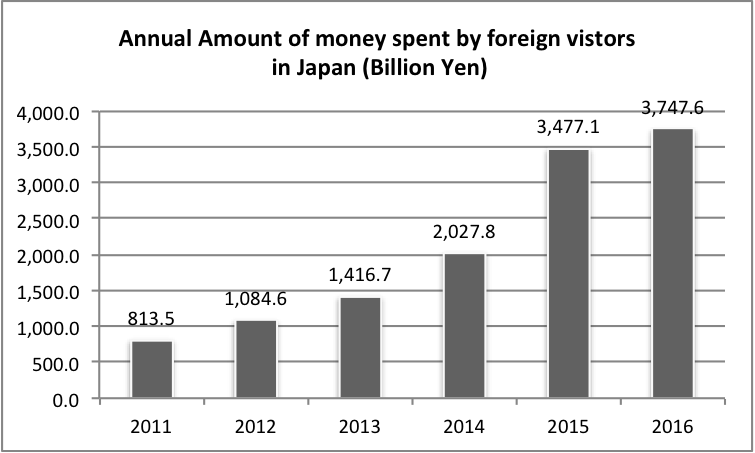 The total money spent annually by foreign visitors in Japan rose to 3,748 billion yen (≒US$32 billion) in 2016 from 814 billion yen in 2011. It took 67 years after the War for Japan to reach 1 trillion yen. Now we see an increase of 2.5 trillion yen in five years. This huge flow of income has triggered Japan to transform into a more “foreigner friendly” country. Nowadays, people are rushing to make products and services targeting foreign visitors: so-called “inbound business” by Japanese. This inbound business is booming in every aspect of the business in Japan: such as hotels, transportation, tour guides, restaurants, IT, agriculture, and retail business. And now, the Japanese government is targeting the market to grow to 8 trillion yen (≒ US$73 billion) by 2020. Another vital change is happening on the investment side as well. Historically, investment in Japan has not been popular with foreigners. The percentage of foreign direct investment (FDI) is only 5% of Japanese GDP, while other OECD countries have an average of more than 35%. There are reasons for Japan to be so unpopular: language and culture issues, the complicated rules and regulations, the high cost of labor, and lack of proper infrastructures for foreigners to live, such as international schools for children. So, it’s natural that people see Singapore a better place to put money and their expats. However, we are seeing some changes in recent years. Although it’s not as dramatic as an increase of inbound business, the balance of FDI has been growing steadily in past several years. It recorded 27.2 trillion yen (≅ US$247 billion) in 2016, doubled from 13.4 trillion yen in 2006. This recent increase is due to the strong initiative by Prime Minister Abe. 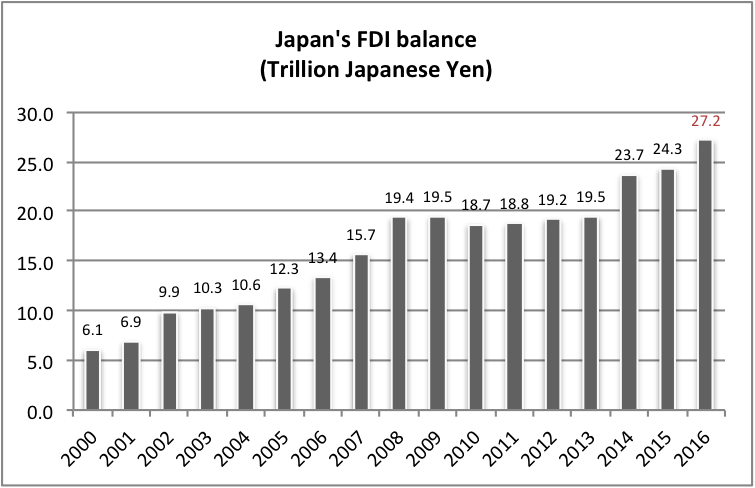 The Abe administration is now targeting FDI balance of 35 trillion yen by 2020 and working on substantial transformation in rules and regulations to bring more investment to Japan. FDI has two types of investment: greenfield investment and inbound M&A. Greenfield investment is an investment in a new venture in a foreign country by constructing new operational facilities from the ground up. Inbound M&A is to invest in a foreign country with the means of merger and acquisition. In Japan, historically, inbound M&A was considered quite difficult due to conservative culture of Japanese business environment. Until not long ago, it was unthinkable for Japanese to have large electronic companies such as Sharp and Toshiba to be bought by foreign investors. However, their perception has changed gradually by observing series of an incident which Japanese companies fail and rescued by foreign investors: such as Nissan’s take over by Renault and Sharp’s take over by Taiwanese technology conglomerate Hon Hai. Now Japanese is much acceptable to foreign investment and convinced that without investment from global investors Japanese companies cannot expand nor survive. Although the balance of FDI is increasing, the business environment for foreigners has not reached the international standard yet. The Japanese government is fully aware of this issue. It has established the “Council for Promotion for FDI in Japan” in 2015 to improve the business environment for foreigners. It has adopted five promises for attracting foreign business to Japan. While above five promises are rather indirect incentives for foreigners to start a business in Japan, the government has also put pledge on more direct promotion as well. See the government documents below for further information. The number of foreign entrepreneurs starting a business in Japan is also growing. 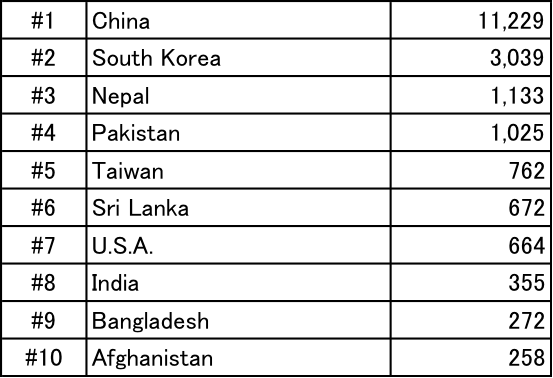 Although there is no public data that shows the actual number of foreign entrepreneurs, the number of visa status for “Business Manager” may indicate the trend. The Japanese government issues visa in various types of status. In order to start a business in Japan, you need to achieve “Business Manager” status—unless you have permanent resident status. 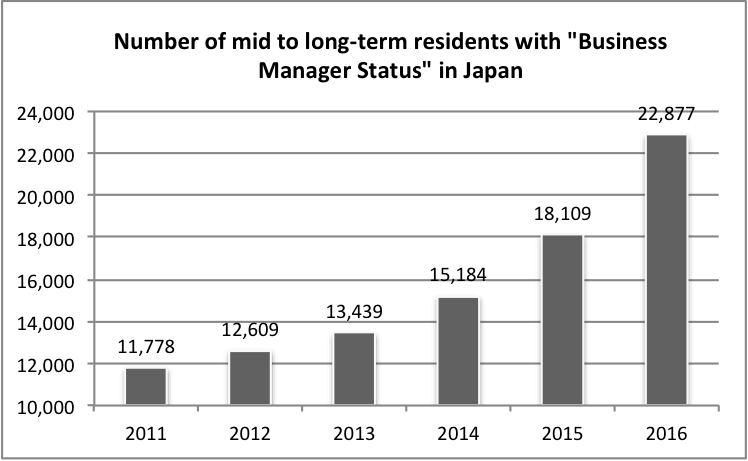 The number of foreigners with business manager status has doubled in the past five years. However, the absolute number is still quite small considering the size of Japanese economy and market. There still remain many barriers for foreigners to start a business in Japan. One of the difficulty is related to the strict Japanese rules and regulations for foreigners. In order to obtain “Business Manager”, foreign entrepreneurs are required to open a business office and hire two or more permanent employees or have capital/investments exceeding five million yen upon submitting his/her application to the Immigration Bureau in order to receive approval for the “Business Manager” residential status. And this condition is not a guarantee: you need to prove the immigration officer that your business will sustain showing a reasonable business plan. If the officer believes it won’t, you’ll not be allowed a business manager status: you can own the company but not manage it in Japan. And this is just a start. Foreign entrepreneurs will face tonnes of obstacles the minute they start the business. So, do you need to be a rich and established to start a business in Japan? Well, it’s interesting to know who is obtaining the Business Manager status in Japan. The above table shows the top 10 of the number of people having Business Manager status by the country in 2016. It is not surprising to find Chinese and Koreans at the top. But it is quite odd to see South Asian countries such as Nepal, Pakistan, and Sri Lanka in the high ranking. They don’t necessarily have the largest population in Japan, but they seem to be very aggressive in business. What this statistic shows is that you don’t have to come from a rich country to start a business in Japan. They maybe running a so-called “Indian food restaurant”, IT development, or HR service in Japan. Whatever they are doing, it is accepted as a sustainable business by the immigration officers. They fought all the obstacles anyone will face and still able to sustain the business. The numbers and developments we saw above suggest that Japan is in the middle of the fundamental transition. A boom in the tourism is just a start. As more people get to know Japan, the next thing people will look into is opportunities for business and investment. Yes, as I mentioned in the beginning, I may be seeing things what I want to see and listen to things I want to hear. I admit it. And I know there are so many foreign businesspeople struggling to do business in Japan. They may not believe the change is coming, So I leave it to your choice to find my view relevant or not. But be aware. What happened to the tourism industry in Japan could well happen to the investment and the business side as well. Don’t miss the wave when it comes.